245 Eldridge St., nr. Houston St.; 212-475-4411. Open now. Try the Sakura Martini (made with sake, gin, Maraschino, and cherry blossom) at this Japanese bar from Kenta Goto — the American Bartender of the Year winner at 2011’s Tales of the Cocktail, formerly of Pegu Club. Snacks such as grilled cheese okonomiyaki are by Bohemian’s Kiyo Shinoki. 133-42 39th Ave., Flushing; 718-865-8158. Open now. Most likely, you think of noodle-slurping, not craft-cocktail-swilling, when it comes to Flushing. But co-owner Todd Leong (Lucky Rice) hopes to change that with this rooftop izakaya serving drinks like Sweet Dreams (bourbon, chamomile, honey, fig) and Taiwanese-night-market-inspired food like popcorn chicken. 9 Ave. A, nr. Houston St.; 646-524-5226. Late Aug. In a bilevel space (complete with an upright piano and old church pews as seating), Darin Rubell, the owner of next-door Boulton & Watt, will serve cocktails like a milk punch (for which his Bushwick bar Forrest Point has become well known) and an on-tap Mojito while DJs spin vinyl downstairs. 134 W. Broadway, nr. Duane St.; no phone yet. Sept.
A 1,600-square-foot space courtesy of the team behind Dear Irving and Raines Law Room. Drinks, designed by Meaghan Dorman, will be divided into Original House Creations and Audience Awards — cocktails that have been hits at the team’s other locations. 252 W. 29th St., nr. Eighth Ave.; 646-429-8237. Sept. Always in short supply: a decent Penn Station-area bar. Haymaker’s 18 beers on tap, which include IPA-forward brews from Other Half and out-of-town selections like Westbrook and Stillwater, complement the kitchen’s gastropub menu. 12-23 Jackson Ave., nr. 47th Rd., Long Island City; no phone yet. Sept. Inspired by Central Europe’s grand beer halls, the 4,000-square-foot spot will dispense brews both local and imported, served according to Czech tradition. (Try the milky mlíko pour.) To eat, Chopped champ James Gillespie’s menu includes duck bacon with blanched cabbage and fruit dumplings. 1641 Second Ave., at 85th St.; 212-989-2100. Sept.
From the owners of the West Village mainstay Agave comes an “agave gastropub” specializing in cocktails prepared using obscure, small-batch spirits like Sophie Decobecq’s Calle 23. Food options include truffle-infused duck breast Wellington. 269 E. Houston St., at Suffolk St.; no phone yet. Sept. While Suffolk Arms was supposed to take over the onetime Meow Mix space in fall 2014, it is finally on track to open before the end of September. There’ll be décor celebrating “notorious” New Yorkers and drinks from bar vet Giuseppe Gonzalez (Pegu Club). 112 Bond St., nr. Pacific St., Boerum Hill; no phone yet. Sept.
Building on Bond — which regulars call Bob — spawns a more grown-up brother bar next door. As the owners are the team behind the Hecho design-build firm, there will be a lot of repurposed décor: a ceiling covered in nearly 50,000 domino tiles and a 1970s jukebox, with music curated by head bartender Josh White. 1684 Woodbine St., nr. Cypress Ave., Ridgewood; 347-696-0612; Sept.
Two bartenders who met while working at Rockwood Music Hall teamed up to open this 700-square-foot spot catering to their neighbors in Ridgewood. Expect mid-century couches, a cozy library, classic cocktails, and a six-tap beer list. 574A President St., nr. Fourth Ave., Gowanus; no phone yet. Oct./Nov. Medal-winning home-brewer Jason Sahler turns pro with a small Gowanus facility (Brooklyn Brine’s former home, which holds 50 people). He’ll use New York ingredients to craft American-style brown ales, stouts, and IPAs, eight of which will be available by the pint in the taproom (the bar is made from a black-walnut tree felled by Sandy) and can be toted home in a growler. 11 Times Sq., nr. 42nd St.; 212-221-3833. Sept.
After multiple delays, spring break is finally coming to Times Square. 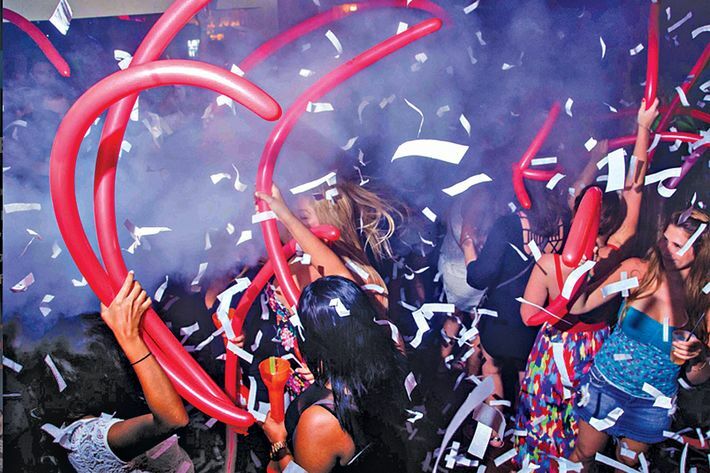 The northernmost location of this notorious party spot (which has outposts in Cancún, Aruba, and other frat-boy-friendly locales) will offer frozen margaritas by the yard, nachos, conga lines, karaoke, booty-shaking contests, beer-pong tournaments, staff flash mobs, and blind­folded dating games. An elevated stage will host the Rolling Frogs Band every night. 180 Orchard St., nr. Stanton St.; no phone yet. Oct./Nov. This sure-to-be-sceney spot on the 15th floor of the Hotel Indigo is from the Gerber Group (Irvington, Kingside). Things shut down nightly at 4 a.m., and there are two terraces, one of which houses a pool and its own bar. Bites will likely be provided by Russ & Daughters and Katz’s. 67 Clinton St., nr. Rivington St.; 212-529-6900. Oct.
Second Floor on Clinton and Barramundi’s will close to make way for this new bilevel spot. The plan’s to close at 4 a.m. seven nights a week. Downstairs is casual, serving drinks and a Pat La Frieda burger; upstairs is a speakeasy with cocktails overseen by Lucinda Sterling. 1215 Myrtle Ave., nr. Bushwick Ave., Bushwick; no phone yet. Oct. The three high-school friends behind Old Stanley’s and King Noodle have designed their latest bar to emulate the mid-’80s Bowery dives where they used to underage drink. They’ll serve $6 mixed drinks and beers, while table shuffleboard and four pinball machines take up the back. 229 W. 28th St., nr. Seventh Ave.; 212-929-9070. Oct./Nov. Underground techno and experimental-rock fans can dance till the wee hours at this 10,000-square-foot club courtesy of Provocateur’s Michael Satsky, who will also program the music. While his lavish Provocateur is famously exclusive, here you’ll only need to purchase a ticket to get in. 199 Bowery, nr. Spring St.; no phone yet. Fall. Operators are tight-lipped except to confirm that Chris Santos (the Stanton Social, Beauty and Essex) will pair with the Tao Group to open this massive venue. Community-board questionnaires show there’s plans for a clubbier venue downstairs and a restaurant-style space with outdoor seating upstairs.